- This environmet was created to make our Profidevelopers team contribution to the Unity Direct X11 2013 competition. 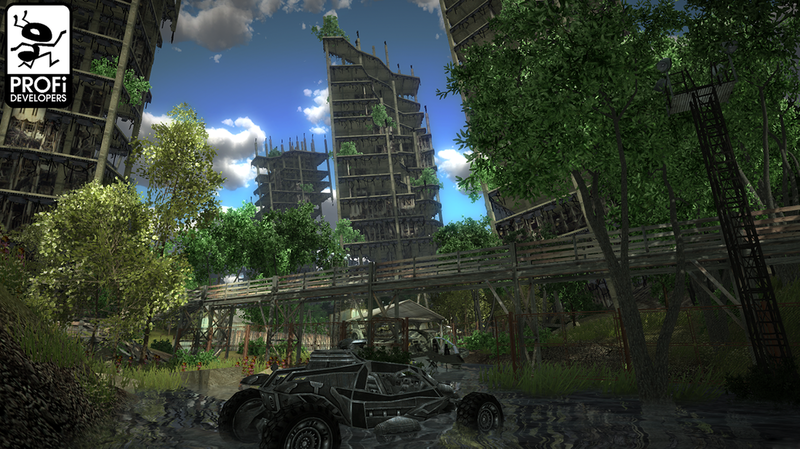 - It is a multiplayer map environment design of deserted city under construction on a remote, forgotten island. Construction site was gradually overgrown with vegetation that has engulfed everything and gave the city post-apocalyptic look. - 4 prefabs trees, 31 prefabs , 1 model of debris,3 models of vehicles, 54 textures, 1 skybox, 2 ambi sounds, 1 song from Fryfex. - The model of ruin and debris has prepared two mapping coordinates. One for the diffuse map and second for the custom light map (so uw strips dosen´t overlap). Coordinates were made manually for best quality. - Demo scene with basic fps controler included. Just push play button.